What would Christmas in Slovakia be without a table full of Christmas cookies? Definitely not the same! And now you can experience this part of Slovak Christmas by entering the latest Slovak Cooking sweepstakes! At least FIVE winners will be chosen at random and will receive a dozen of assorted home-baked cookies – like those shown on the left. No purchase necessary and no strings attached. All you have to do to sign up is enter your email address below. Sweepstakes ends December 15th, 2010 at noon 4pm 8pm ET and is open only to residents of the United States 18 years of age and older. 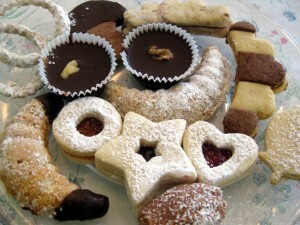 The cookies contain nuts, flour, eggs, and other ingredients. By entering the sweepstakes, you agree not hold Slovak Cooking liable for any damages or medical issues that may arise from consuming the cookies. The winners will be notified by email immediately after the conclusion of the sweepstakes. Good luck! Update Dec 15th, 2010 @ 8:30pm : This sweepstakes is now over. Over 600 people entered this sweepstakes. Quite a good turnout, I say. The five winners selected at random are Jen T., Kim T., Rebecca S., Jodi K., and Ivana. Check your email if you think this could be you. And if you didn’t win, no worries, there will be more giveaways coming up for you to try your luck in. Thank you all for entering and Veselé Vianoce to all! I hope Santa is good to me this year – I spent the entire Thursday and half of Friday baking cookies. Medvedie Labky (Bear Paws): vanilla crescents covered in powdered sugar and optionally having their ends dipped in chocolate. My grandma’s recipe. 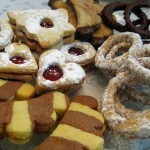 Srdiečka (Hearts): these are the shortbread hearts, stars and circles joined with jam. I used red currant jam to join the hearts, raspberry to join the stars, and plum butter for the circles. Hrebienky (Striped combs): these were not made in my family, but I like this recipe because it’s so colorful. The pieces left-over from cutting out the striped combs are mixed together to get the marble cookies. I joined the striped combs with apricot jam, and the marble ones with Nutella. Venčeky (Wreaths): these sugar rings are my favorites. They are not too sweet and have a nice nutty flavor. Oriešky (walnuts): cocoa-flavored shells joined together with sweet cream. I also used the same dough to make the mushrooms. Šuhajdy (chocolate truffles): another very typical dessert, sweet chocolate with a layer of nut ganache cream. Another typical Slovak Christmas treat are rum balls. I didn’t make them for these sweepstakes since they are made with raw eggs, and should be eaten fresh. Thank you! And please tell your friends, especially those who are new to Slovak cuisine. I am basically doing this to promote Slovak food – and the site. What is Christmas? Christmas is Love. Merry Christmas, I Love You! Oh wonderful! Will there be Medovinky? I lived in SK for a few years and one of the things i miss most is “Starka Marka”s cookies. Would go good with Slovakian peach brandy. Thank you. I love your cookies. I love home made cookies. I’m the original cookie monster. Your cookies look so yummy. Thank you for having such a delicious giveaway. This is great. My heritage is Slovakian, however, both my grandparents passed before I was born so I am trying to learn as much as possible about the culture and food! This is so awesome! Thank you all who have entered so far! Stasi – do you mean medovniky, gingerbread cookies? Nope,not this time. I am not too artistic, but one of my friends has a cookie bake shop, so maybe I could get her to offer these in the future. Theron – or borovička, the juniper brandy. Debby – glad to be of service. I am hoping to help preserve these wonderful traditions through this site. Nowadays, many young people are no longer into cooking and instead opt to eat out in restaurants, so many of these orally handed down recipes are dying out. That would be terrible! @ The response to young people not cooking anymore….I am 25 and so many people are shocked that I cook all of the big Slovak meals and I think that is so sad. We are all Americans but I think we all need to preserve our heritage. I really love your site, even if you come to a point where you can no longer add recipes please never take the site down. I always refer to it when I cook so I don’t forget things because I am still just starting out and unfortunately do not have my Slovak grandma any more. That’s awesome, Stephanie. And no worries, I don’t plan to take the site down, even though I am sure I will eventually run out of recipes, or will move on to some other hobbies. But I figured I got at least a year of recipes left. 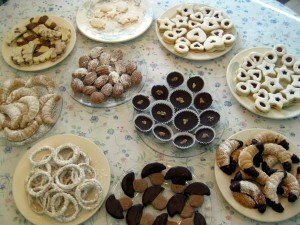 I want to learn how to make the various deserts, and there is a ton of them in the Slovak kitchen. Hello! I am new to this site. I love trying out new recipes and foods. Thank you for sharing your time and talents with us. I look forward to following your blog and I have already “liked” you and connected with you on Facebook! I love your site. I was born in the czech republic but came to the U.S. as a child and now my parents moved back (a few years ago) so I don’t have anybody nearby to cook for me. So, I’m having to learn to cook the traditional foods myself. A lot of your recipes are similar to the czech version so I’ve been using your site lately. In fact, today some friends are coming over to have some segedy gulas & knedliky. Sounds fun. Wish I could enter. Yummy! Yummy! Thank you for the lovely giveaway. Hi guys, originally I had this sweepstakes closing at noon, then I moved it to 4 when I found I will have to go to work today. Well, I just got home from work but got few things to take care of first. So, I am leaving the sweepstakes open for another few hours. enjoys the traditions that we shared with them. your webb site, IT’S GREAT…. I just was invited to your site by a friend. Your recipes look excellent and you have some wonderful ideas for cookies. Very impressive. I just received your cookies yesterday..and might I say they were absolutely delicious!! I have never had Slovak cookies before and now I will attempt to make some 🙂 thank you again for this wonderful surprise 🙂 Happy Holidays to you! I was one of the lucky reciprients of a box of cookies. They were the most amazing & delicious cookies!! I haven’t tasted cookies like that since I was a child. My husband & I devored the cookies within minutes….yum. Wow wonderful post. I just love these cookies.Thanks for your great service.